Feith Takes Iraq Policy Debate to Georgetown Douglas Feith left a high-profile Pentagon job, where he helped shape U.S. policy leading to the war in Iraq, for Georgetown University. He's now teaching a seminar on the Bush administration's war on terrorism. 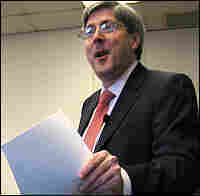 Douglas Feith left a high-profile Pentagon job, where he helped shape U.S. policy leading to the war in Iraq, for Georgetown University. He's now teaching a seminar called "The Bush Administration and the War on Terror." Students skeptical of the war are impressed by Feith's teaching skills.